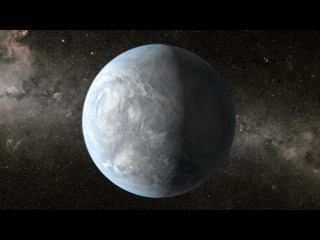 An artist's conception depicts Kepler-62e, a super-Earth planet in the habitable zone of a star smaller and cooler than the sun, located about 1,200 light-years from Earth in the constellation Lyra. WASHINGTON — The alien worlds known as "super-Earths" may be more like our own planet than previously thought, a new study suggests. Super-Earths — exoplanets slightly larger than Earth — are common throughout the Milky Way galaxy, but because of their massive gravity, scientists have assumed they should be water worlds. According to a new model, however, tectonically active super-Earths likely store most of their water in the mantle, leaving exposed continents and oceans that could create a stable climate such as that of Earth. A super-Earth with twice the radius of Earth would have 10 times the mass and 10 times the amount of water as Earth. The big planet's gravity would be three times as large as Earth's, squashing the planet's topography by a factor of three and creating shallow ocean basins, researchers said. Given so much water and a shallow place to contain it, conventional wisdom holds that a super-Earth's oceans should overflow their basins and inundate the exoplanet. However, on Earth, a lot of water is stored in the mantle— the rocky layer that makes up most of the planet's volume and mass — and moves between the oceans and mantle as tectonic plates shift. Seafloor pressure, determined by gravity, controls this process. Cowan and colleagues modeled water storage on super-Earths, finding that the heftier gravity would create massive pressure on the seafloor, forcing water into the planet's mantle. "We can put 80 times more water on a super-Earth and still have its surface look like Earth," Cowan said in a statement. As a result, these planets should have landmasses that stabilize the climate, instead of being submerged in oceans. If these planets, which are relatively common in the galaxy, turn out to have stable climates, their ability to support life as we know would be higher than previously thought. Of course, the gravity on such worlds is much greater — perhaps three times as large — but Cowan doesn't believe that rules out life. "I don't think 3-G is a big problem for habitability," Cowan told SPACE.com, adding, "fighter pilots can handle it." The researchers' model contains two major uncertainties, however. It assumes that super-Earths have plate tectonics, and it relies on estimates of the amount of water in Earth's mantle. The next step to confirm the model's findings would entail launching a high-contrast imaging mission in space to take pictures of these super-Earths and verify that they actually do have continents and oceans. "Our model is a shot from the hip, but it’s an important step in advancing how we think about super-Earths," Cowan said.